Southern Fried Notice: Reny Tyson is a graduate student at the Duke University Marine Lab currently on location in Antarctica tracking Humpback Whales. 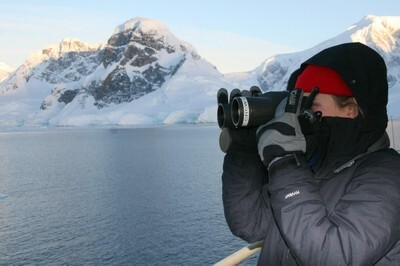 The main expedition blog is Tagging Whales in the Antarctic Seas hosted at the Nicholas School of the Environment. Follow their adventure as they track Humpbacks through Antarctic Seas. Today we begin a journey south towards the Western Antarctic Peninsula to begin year 2 of our program, Multi-scale Interdisciplinary Study of Humpback Whales and their Prey, aptly referred to as MISHAP. We are a team of scientists representing 8 institutions and organizations attempting to understand more fully humpback whale foraging ecology in Antarctic waters – how much are they eating, what are their behaviors associated with eating, and how does the behavior of their primary prey, Antarctic krill, affect their foraging behavior. During last years cruise we encountered some of the highest densities of whales ever recorded and many superswarms of krill (over 3 million tons) in several coves and bays along the Peninsula that the whales were happily foraging on. We are using the DTag (Digital acoustic recording tag) to observe the underwater behaviors of whales while concurrently measuring the behavior and density of krill with several acoustic samplers. This year we are adding a few dimensions to our study including putting a crittercam on the whales and obtaining biopsy samples of the animals. We are excited to see how the conditions will be this year – will we encounter such high densities of krill and whales this year? Will the coves be full of ice by the time we get there? We shall find out in a few short days..
From a personal note – I can’t express how grateful I am to be part of such an adventure. To be able to work with these scientists with these animals in this environment is indescribable. If you want to follow along with us on our journey check out our blog Tagging Whales in the Antarctic Seas. We will be posting as often as we can (with our very limited bandwith) and we will check back in with our friends here at Southern Fried Science a few times during our journey. If you have questions for Reny or the Antarctic team, please leave them in the comments section and we will forward them on.